Saint Christopher. Please allow my mother and sister travel safely to Europe. Protect them. Please be with my daughter and grandson tomorrow on their trip. Protect them and guide them safely back home. Amen. Please watch over my daughter and her friend, add they travel this week. Please keep them safe, happy, and healthy and let no evil touch them. Please protect my grandson Luke as he leaves for travels to Germany and abroad as he leaves this month. Keep then under your wings of prayer during his travels and return him safely home. St. Christopher, protect evah along her travels as you did me. Let her receive a safe a prosperous journey. Amen. please intercede for me to our Lord Jesus Christ and let me have accident free journeys as I begin driving again. Also intercede for me to our Lord Jesus Christ so my driving phobia will be cured forever. Amen! May God send you to protect my mother and her friends as they travel through Europe. I ask that you guide and protect them every step of the way and safely return them back home to the comfort of home here in the United States. Please bless and protect the planes that carry them and the pilots that fly them. I thank you Lord for working thru Saint Christopher and giving him the gift of bestowing safe journey. In Jesus name, Amen! Please watch over our granddaughter who will be traveling abroad early next year. Guide her to safety and bring her back to her school and home safely. Please protect the transportation she will be on and the pilots that fly them. Please protect her from all harm and bring home to the loving arms of her family. I ask this in the name of Jesus Christ. Amen. Dear St Christopher...Thank you, Thank you, Thank you for your wonderful prayers and in God's name I bless you...Alleluia! Saint Christopher, please help my Dad to have a safe trip from Rossford Ohio, to Atlanta Georgia so he can come home to be with his family that loves him very dearly, Amen. Dear St. Christopher, please watch over our daughter, Veronica, as she drives to the mall tonight to go Christmas shopping. She is a new driver, so please keep her safe and out of harms way. In the name of Jesus, Amen. Dear Saint Christopher, please watch over my daughter as she travels to London today to study. Please protect her on her trip to there, during her short period there and please bring her back to home again to us safely when the semester is over. Please watch over my daughter as she travels to and from Chicago for work. May she and all travelers around her be mindful of each other. Please keep her safe. Amen. Watchful and ever careful Saint Christopher, please protect Steven as he travels south for the beginning of his new teaching position. If he tires, provide him with council to stop and rest. If others who come his way tire, offer them that same council. Please keep him and those he passes safe. In the Lord's name I pray, Amen. Watchful and ever protective Saint Christopher, thank you for keeping Steven safe. I ask again for your protection as we, as a family, travel south to begin a new chapter in our lives. Provide us with the council to stop when needed and keep all of us safe in the two xars we use. Please keep those we pass safe also. In the Lord's name I pray, Amen. Watchful and ever protective Saint Christopher please provide protection for my daughter, sister and myself on on flights to and from next Tuesday and returning Saturday. Guide and protect our pilots as they carry us to and from our destinations . In the Lords name I pray. Amen. Please protect my husband Frank on his business travels. PLEASE guide and protect him every step of the way and return safely return home. Please bless and protect the planes and the pilots that fly them and car he is in.. Thank you Lord for working thru Saint Christopher and giving him the gift bestowing safe journey. In Jesus name, Amen! Dear st Christopher please pray for my daughter Christie that she will have a safe trip to India and Dubai and back home again. Ask God to keep her safe and sound. Please ask jesus to bless her and be right next to her during her travelling. April 18 to May 10. Dear St. Christopher , Thank you for blessing and saving Mom and myself today from what was almost a most terrible accident. Thank you for alerting me at the last moment. I keep your medal in my car always so you are always with me and today you took over when we needed you.i will forever be grateful to you St. Christopher . Amen. Dear St Christopher, please intercede on my behalf to God so that my driving phobia can completely go away. Please grant me the serenity I require behind the wheels and above all please ask God to protect me from the dangers of the road. All this I ask through Christ our Lord Amen! St Christopher, please keep my grandchildren, Maddie and Jack, safe as they drive to Charlotte and back home to Atlanta over this holiday weekend and all times in the future. With gratitude. For my grandson and his band friends going to Europe Watch over them and let them travel safely back home In Jesus' name. For my son and his teammates. Watch over them let them arrive safely and return safely. In Jesus name I pray. Dear St. Christopher, please keep Rachel, Dan, and Matthew safe as they travel today. St. Christopher please keep my sister and her family ( Jan, Matt, Kieran and Jonah) safe as they travel to visit family over the weekend. Please bless and protect them and all those they encounter. Dear St. Christopher....Thank you for so many prayers and your powerful protection for my husband, who works away so much. Please continue to pray for us in our lives and travel. Thank you. Dear St Christopher, Please pray and protect my daughter who is travelling the Us.Please look after her during her travel and let her return home safe. Thank you. Also please pray for all travellers and protect them. Please keep me safe and at peace in all my driving. St. Christopher, I ask for prayers for the protection and safety of my husband and I as we travel to and from Mexico this upcoming week. Thank you. Please watch over our granddaughter who will be traveling to Puerto Rico today with her job. Guide her to safety and bring her back to her school and home safely. Please protect the transportation she will be on and the pilots that fly them. Please protect her from all harm and bring her home to the loving arms of her family. I ask this in the name of Jesus Christ ,Amen. Dear St Christopher, Please protect my grandson and his band friends that will be traveling by bus to a band competition today. I pray to you for the safety and watchful eyes of the bus driver. Please protect our grandson on his travels to and from his destination,Amen. Dear St. Christopher...I thank you so much for your most powerful emergency prayers for my husband this past week...when that one journey could have turned out so very differently. I truly thank you for coming to his rescue. St. Christopher I humbly ask of you to please help my grandson while on travel to his destination, cover him with your mantle of protection, keep him safe from harm, protect him from unscrupulous persons that may cause him harm. Dear St Christopher, watch over us on our travels. Keep us safe from harm and protect us. Bring us safely home to our waiting families. Amen. Dear St Christopher, please watch over my husband and I on our upcoming travels through Europe in November. I ask that you Keep us safe and out of harm's way and protect us every step of the way and bring us back home safely to the US to our families. Please bless and protect the planes that carry us and the pilots that fly them. I also pray and ask that God will always be by our side and watching over us, too. Thank you for hearing and answering our prayer. Amen. Please St Christopher protect my son Daniel as he starts driving on his own tomorrow. Please keep him safe and wrap your protective arms around him. Please be with him in his travels. I will buy a medallion to put in his car ASAP. to St Christhoper please watch over my loved one jo judie and the rest of the seafearersmates as they travel heading to africa I am asking for your guidance and protection for whatever they will encounter of misfortune while on the route. may jo judie keep safe and may overcome all the longingness he may be felt & be more positive for it. that the captain of their ship may serves as youre image as their protector.and pls let judie came home safe after his contract. watch over our family on our trip to Philippines. protect us at all times and keep us healthy and away from fear. Bless the planes and the pilots and crew so we can have an enjoyable and easy flight. Thanks, Foe sharing the blog this is a lovely blog. Keep sharing. Be sure to THANK Jesus Christ and St. Christopher when each portion of a trip is completed. Don't forget their Guardian Angel. Dear Saint Christopher, please protect Gerardo on his journey and bring him back here safely. Please guide and protect him from all evil. Please keep him healthy and away from danger and fear. In Gods name, Amen. 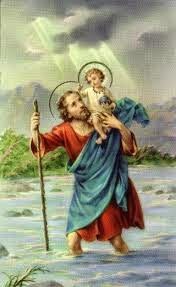 St.Christopher, please protect my husband, as he goes to work and back, he puts his life in danger every day. Protect him in Jesus name I pray. St. Christopher, please protect my son and his friends as they travel this weekend. Keep them safe and free from all harm. Amen. St. Christopher please keep my sisters and I safe as we travel to Key West for a fun vacation this weekend.